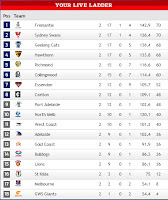 Get on your nearest AFL Ladder Predictor - the Fremantle Dockers can finish top. Yes that's right, and you heard it first here on Uglybustards. All it takes is Hawks to lose to Norf and Swans, Swans to scrape home against the Cats and Hawks, Cats to lose to Swans then beat Brisbane, and for Freo to thrash Port and St Kilda. 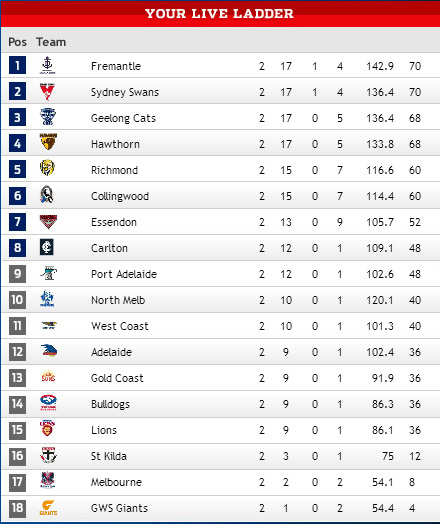 This puts Freo on top, same points as Swans but with a healthier percentage. The top 4 finishes up Freo, Swans, Cats, Hawks with a couple of very interesting Qualifying Finals in week one of the finals series. The bottom half of the 8 is also looking very interesting. Richmond should beat Essendon and the Giants comfortably, keeping its percentage above Collingwood who face the Ducks and Norf. The Dons will probably stumble into 7th with six losses on the trot, with Carlton and Port to play off in what could well be an Elimination Final at Aami Stadium before the real thing happens. The winner will most likely play the Tigers, which I'm sure they'd prefer over Collingwood. The Pies should pumble Essendon in the other Elimination Final as the Dons scandal-plagued season splutters to an end. On to the highlights tape and Cyril celebrates the start of the EPL with some exquisite soccer skills, he played the oval ball as it were round, beat two defenders and got past the goalie to slot a major. Casboult's wasn't too bad either except he was offside. 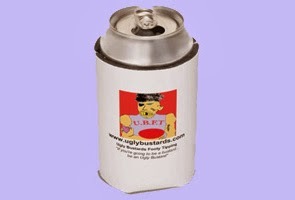 Roll the tape Zenon, then read on for the latest in Uglybustards tipping results. Craig Nettlebeck has come from the clouds the last two weeks, rocketing up the Uglybustards Tipping Ladder from 13th to 2nd!!! Sam Griggs leads the comp by 6, and overall moved up 14 spots to 187th, just four correct tips behind the current leader out of half a million AFL tipsters in footytips.com.au. The Prize Pool minor placings in Uglybustards are going right down to the wire. Billycat has been caught on points by Arnold Layne and powerful and holds them off by a slender margin only. Simon Williams and reigning Champ Longee are just one point in arrears, Longee one of just 4 tipsters to get 8/9 this round, along with The Lace, Junior Easter Bunny and Nettlebeck. Anyone's guess from here. In the Margin comp the Hawks swept aside the Pies quite comfortably, causing some small movements on the ladder. The Lace was unperturbed as usual, and is on track for the best ever cumulative margin in Uglybustards Margin History. Glen mcphee overtook DrBB to move into 2nd after tipping only 2 points off the margin, and now sits just 15 points behind The Lace. An impressive performance considering McPhee was placed 21st six rounds ago. Sam Griggs and Simon Williams both climbed a couple of positions and this week are 4th and 5th, which equates to 2nd and 3rd in the prize pool placings, 35 and 47 points off the lead respectively. More details on the Tipping Ladder page if you scroll down to the Margin ladder. In the Trivia comp I scored a moderate 8/10 to lead Griggsy by 13 points, with Griggsy having the round in hand, and the potential to get with 3 points with three rounds to go. Gonadbreath leads Rotten Ronnie by 47 points in the battle for third. To join the orgasmically thrilling Trivia comp, login to footytips.com.au then go to http://www.footytips.com.au/tipping/afl/trivia. Another difficult round to pick sees the Weekly Prize climb to $20 for round 22, that's your entry fee back. If it doesn't go off in the next two weeks it carries over to the finals, where a fine amount will be eventually won by a lucky punter. All the best in Round 22, and may the tipping Gods go with you. Disclaimer: these posts are the work of an Ugly Bustard late at night after the odd tsipouro or three and are prone to contain erroneous errors.